The Detroit Red Wings can clinch a spot in the Stanley Cup Finals for the second straight year against the Pittsburgh Penguins and likely ensure that the Finals begin this weekend by beating the Chicago Blackhawks on Wednesday night. 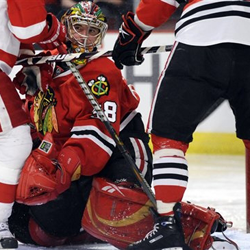 And Detroit is a -245 money line favorite to finish off the Hawks. Both teams will be down two very key players. Chicago’s situation is a little worse, as it is without winger Martin Havlat, the team’s leading scorer, and goaltender Nikolai Khabibulin. Both veterans left Game 4 with injuries. Havlat left the 6-1 loss after a hard hit from Detroit’s Brad Stuart. Khabibulin participated in the pre-game skate but couldn’t start after getting hurt in Game 3. Chicago’s Cristobal Huet will get the call in goal after looking terrible in Game 4, and Colin Fraser will replace Havlat in the lineup. Meanwhile, the Wings will once again be without star players Pavel Datsyuk (foot) and Nicklas Lidstrom (lower body). Rookie Jonathan Ericsson will fill in for Lidstrom again on deffense and did well in Game 4. Valtteri Filppula has four points in the past two games, filling in for Datsyuk, a winger on the No. 1 line. In reality, Chicago has little chance tonight unless Huet stands on his head. Before Game 4, he hadn’t played since a 4-2 win at Detroit in the season’s final weekend in which he made 21 saves. On Sunday, however, Huet allowed five goals, something he did just three times during the regular season, including in a 6-4 loss to Detroit on Jan. 1. In fairness, Huet did fare pretty well in Game 3 in relief of Khabibulin, as the Hawks won in overtime. And in Game 4, the Hawks committed 16 penalties in front of him. ‘It’d be tough on anybody to start a game after being off a month, but it’d be especially tough for a goaltender,” Hawks defenseman Brian Campbell said.